Five months ago saw the release of Ghost in the Shell: Arise border: 1 Ghost Pain in theaters across Japan. This past weekend saw the second release of the four-part series with Ghost in the Shell: Arise border: 2 Ghost Whisper—a story very much on the other end of the mystery-action spectrum. In the last episode of Arise, two of the Ghost in the Shell cast were notably absent: Ishikawa and Saito. In Ghost Whisper, however, these two have major roles and the whole team except for Togusa appear—though admittedly not on the same side. While often overlooked when next to Batou, Togusa, and the Major, the remaining characters (sans Borma) are all given their own special moments to shine and do a good job, showing the special assets they can bring to the team—i.e., what makes them unique. All in all, this episode serves as a good introduction to the characters the Major will eventually choose for her team. All too often, cyberpunk adventures take place at night or in some other dark location where it's often hard to see the action going on. This is not the case here. There are no dimly lit fight scenes in Ghost Whisper. For the most part, this episode takes place on roads and rooftops, showing a completely different side of the city from what we saw in the first episode of Arise. Moreover, the series uses this change of setting to its fullest—be that by showcasing exciting car chases or by watching the Major ride a Logicoma through the sky as it does its best impression of Spider Man. In the early 2000s, we all saw what happened when airlines were targeted by terrorism and national/international travel became something to fear. Ghost Whisper shows a world where terrorists attack something even more fundamental to our lives than air travel: travel by car. In a world where cars are generally driven by autopilot (often with the “driver” surfing the web or the like), turning off this system remotely for a large number of vehicles at once can end in only one horrible way. Over the course of the episode, the terrorists show several times that they can—and will—do this very thing over and over until their demands are met. This is an amazingly powerful terrorist threat. When the freedom to travel is revoked—where it becomes a danger to go to the store or go to work—everything from social interaction to the local/national economy are bound to suffer. In other words, this makes for a conflict that is far more interesting than a played-out threat like a bomb or a hostage situation. Several of Ghost Whisper's best scenes involve the Major and her relationship with her Logicoma. In the real world, the Major appears as a small-sized human female while the Logicoma is a massive walking tank. But in the online world, we are able to see how they perceive themselves to be in their own minds. The Major is still a human female, but the Logicoma is small and childlike—almost a toy of its real world self. It is clear in this setting that the Logicoma looks up to the Major and the Major, in turn, treats the Logicoma like a troublesome child. It is the start of what could become the series' most interesting relationship. The unfortunate part, however, is that this barely scratches the surface of what could be explored. As a person who has never had a physical human body, the Major is in many ways the ideal of what the Logicoma would want to become: a robot with a soul. Looking at all the complexities in their relationship would be captivating; and only getting the barest taste of it like we do here just feels like a missed opportunity. If there is one weak point in Ghost Whisper, it is that it feels the need to “pay homage” to iconic moments for no other purpose than that they were iconic moments. These shoutouts are referencing moments not only from previous Ghost in the Shell works but also from the last episode of Arise itself. Does the Major really need to lose an arm every episode to mimic the famous scene in the original Ghost in the Shell film? Does every story have to center around “ghost hacking” in some form or fashion? Do we really need to see the Major and Batou fight again even though we just saw it happen in the last episode? But even worse than the retreads is how the series always treats new characters in the same fashion. Either (a) they are going to die and pass on some important information or (b) they are actually one of the villains in disguise. The major supporting characters seem to only be able to fit into one of these two roles—making any supposed twist obvious the moment we see a new face. And worse yet, without the twist, the characters become basically irrelevant except as a tool for moving the plot forward. While Ghost Pain was a cyberpunk noir murder mystery, Ghost Whisper is more along the lines of a “beat the terrorists” action film. It's fun and exciting with its unique terrorist plot—though it's far from being anything deep. Still, if you like cyberpunk in general (and Ghost in the Shell in specific), it's certainly worth a watch. 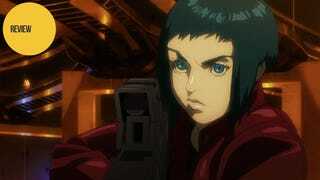 Ghost in the Shell: Arise border: 2 Ghost Whisper was released in Japanese theaters on November 30, 2013.